It's always a surprise when an embedded system reveals its inner workings. Somehow I assume such systems are built on some super-special technology, not HTML and Internet Explorer. Sure enough, the receipt said my credit card had been charged $NaN. I can only imagine what the billing backend would make of that. I called my credit card company to check what really happened, but the day's transactions weren't available yet. I see a couple morals to this story. The most obvious is that normal people don't swipe their credit cards through a machine offering to bill them $NaN. 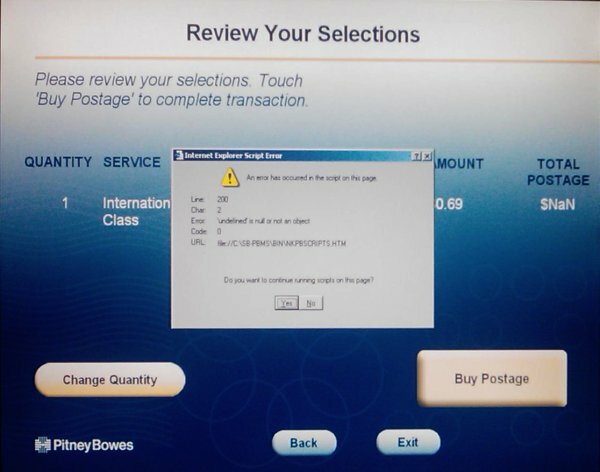 But the more relevant moral is that error checking and software testing is a good thing, especially when monetary transactions are concerned. P.S. I emailed the kiosk support, and they assured me that the billing problems following a "system change" were resolved, and I'd be billed the proper $0.69.